TUV leader Jim Allister has echoed calls by the son of a murdered IRA informer to have Martin McGuinness questioned about the shooting. Frank Hegarty had been living in England before his murder, and his family has claimed Mr McGuinness promised them that he would be safe if he came home. But when he returned to Londonderry in 1986 he was shot dead by the IRA. 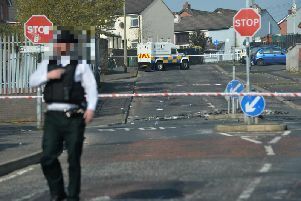 The murder is to be investigated as part of a probe into Stakeknife, reportedly a senior Army agent within the IRA. Mr Hegarty’s son, Ryan, said Mr McGuinness “needs to be questioned”, but the Sinn Féin Deputy First Minister said he “had absolutely no role in the death”. TUV leader Jim Allister said BBC Spotlight had this week raised questions about the murder which demand “relentless” investigation. A recording of Freddy Scappaticci – the man claimed to be Stakeknife – featured on the programme puts Mr McGuinness “centre stage” regarding how Mr Hegarty met his end, he said. “Who colluded in having Frank Hegarty murdered is a key question which must have no boundaries and no untouchables if any investigation is to be credible,” he added. UK intelligence has questions to answer, he added.